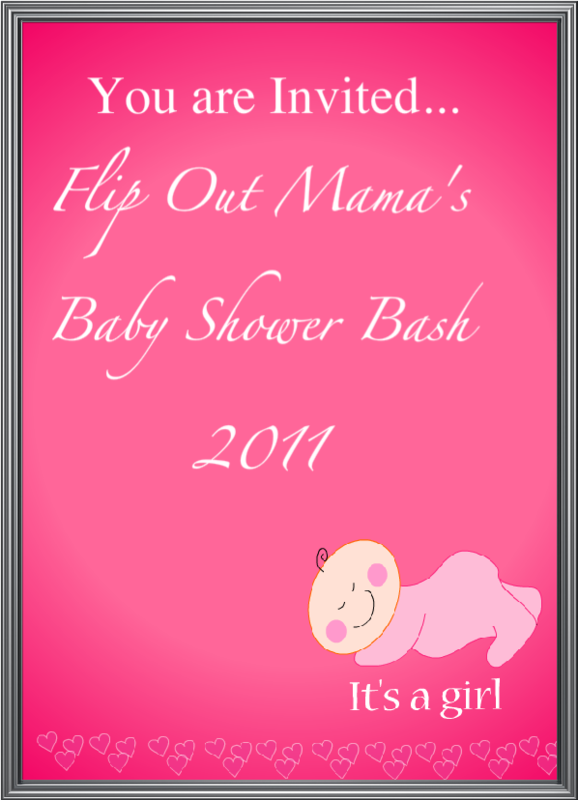 Flip Out Mama: Baby Shower Bash #2: Woombie! Time for Baby Shower Bash Sponsor #2! This review takes me back, waaaay back..
To almost one year ago, when I was a brand new bloggy chick. Woombie was one of the first products I ever had the honor of reviewing, and to this day, remains one of my all time favorites! Let's all pause for a moment of uncontrollable laughter. "As a parent, we all know how difficult for us the transition from birth to 6 months can be... sleepless nights, confusion, not knowing, feeling overwhelmed, trouble feeding, Colic, and of course, the wonderful hormonal shifts we face! Most of us know about the comfort and many different benefits that are achieved from swaddling newborns, which has been done for hundreds of years. The WOOMbie was created after my third daughter was born. I was feeling such frustration with all of the swaddling blankets and contraptions that I bought to help with the new baby. Even as a seasoned parent, there are still new issues, as every baby is so unique.Our situation was not only with comfort...but with safety. 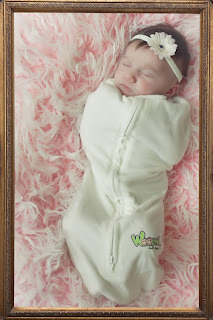 After finding Bella with a name-brand swaddling blanket unraveled and over her face, i knew there had to be a better and safer way to swaddle." Just check out this baby girl, must I say, much more photogenic than my Bean in his Woombie! 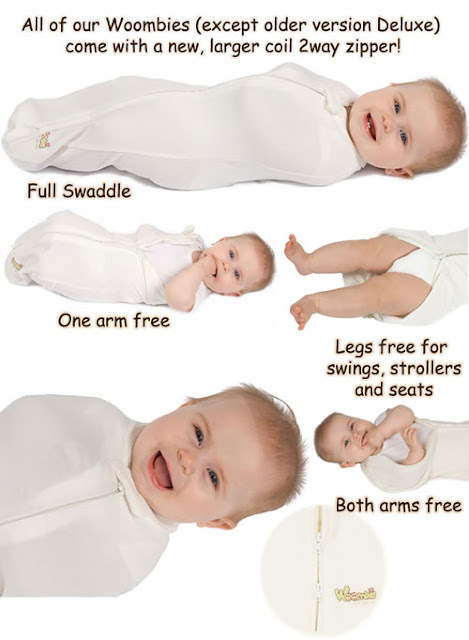 The Woombie is a one of a kind swaddler, allowing your baby to stretch as needed, just like in the womb! The Woombie prevents startling, face scratching, overheating, and blankets from getting stuck in baby's face. It can help soothe babies with colic, and is super easy to use. Just put baby in, and zip it up. It won't come undone! The Woombie comes in ten different styles. I will take a moment to break them down for you, 'cause I am so sweet! 3. Organic- much like the original, but with organic fibers. 4. Deluxe- fancier version of the original, moderate swaddle. 5. Houdini- thicker, firmer swaddle than the original. still stretchy, but less stretchy than the original. 6. Winter- 100% polyester micro fleece. This is the most restrictive Woombie, with a firm swaddle, and minor stretch. 7. Convertible- arms open to convert to arms free sleep. relaxed neckline, and two way zippers. 8. Leggies- original Woombie, with legs! Perfect for strollers or carseats! 9. Convertible Leggies- arms open to transition baby. Check out all the wonderful ways you can use your Woombie! This was definitely one of my favorite products with The Bean, he really loved being all snuggled up in his little Woombie cocoon! He was always a little bit of a wild sleeper, and he always wrestled with other blankets and had them ripped off in about five minutes. The Woombie was the only thing that could keep him snuggly and warm! Watch this video for proof of just how much babies love the Woombie! It's precious! I am so happy that the wonderful folks @ Woombie are donating a Deluxe Woombie to give to Crystal at her baby shower! I know she (and Miss Sadie) will love it! If you would like to order a Woombie for your own little one, just click here! Disclosure: I received a sample product in exchange for this posting. Although a product was received, all opinions are my own, and no monetary compensation was given. Yay! I absolutely love the Woombie!! !